Which image best sums up Fife for you? Your photographs have been flooding in for our fantastic new competition! Some 95 stunning images of Fife have been captured and submitted so far, but which one will catch the eye of our judges? Send us your pics of Fife like this one in Aberdour. Pic: Fife Photo Agency. The contest has only just been launched so you have plenty of time to send us your pics which sum up YOUR view of the Kingdom. PLEASE NOTE: We have received a lot of portrait images but the terms and conditions clearly state that only photos sent in landscape format will be judged. Any portrait images can not be included in the competition. Your mission is simple – submit a picture which, in your mind, sums up Fife and tell us why. It’s open to all photographers and you can use anything from your smart phone to state-of-the-art kit. Send your pics (maximum of three per person) to: myfifecomp@gmail.com before August 10. Or it could be a landmark like this one of Ravenscraig Castle in Kirkcaldy. Pic: Fife Photo Agency. Please include your name, a contact telephone number and address. Pick up your camera and choose the location, scene, or landmark that best sums up your town or village – the only caveat is it MUST be in the Kingdom and they must be in landscape format. Our panel of judges will then pick the very best which we will publish and invite our readers to help pick the overall winners. We have a fantastic first prize for the best photo – an overnight stay for two, (which incldes breakfast and use of the spa facilities), at the five star Fairmont Hotel in St Andrews. And the winner will have their special photo framed by Sproson Gallery and Framer in St Andrews. The runner-up will also have their photograph framed and win a meal for two people at The Woodside Hotel in Aberdour. The third prize winner will have their photograph framed. 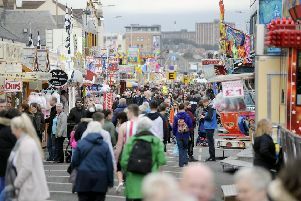 As well as the gallery of photos here, look out for a selection of pictures across our newspapers – the Fife Free Press, Glenrothes Gazette, East Fife Mail, Fife Herald and St Andrews Citizen. Deadline: Friday, August 10, 2018.
l Photographs must be in a landscape format and between 2 and 5MB in size. l All entries MUST be submitted by email to myfifecomp@gmail.com. Only entries uploaded and submitted to this address will be judged. Entries to any other email address or via CD/DVD/memory stick will not be accepted. l Each image must be sent in jpeg format with a medium to high quality. l Entries must depict an image of Fife. l The entries must be clearly marked ‘My Fife Competition 2018’. Entrants should also include a contact address and telephone number. l Closing date for all entries is 5pm on August 10.
l Three photo submissions ONLY per photographer. Copyright: As this is a Fife Free Press Group commercial venture, copyright of entries must be waived for the competition and all promotional events surrounding it. Outwith these parameters, copyright is retained by the photographer who gives the Fife Free Press Group permission to use their photograph. The photographer / copyright holder grants the FFP Group permission to use any image in all media, including online, for the purpose of publicity, promotion and exhibitions in conjunction with the competition and future competitions publications and all promotional activities, without any remuneration being due.